The Singapore Airlines (SIA) Group is significantly increasing its involvement in Asia’s fast-growing low-cost market with the establishment of a new Scoot affiliate in Thailand and a new Tigerair affiliate in Taiwan. The projects further intensify competition in Asia’s dynamic LCC sector and gives Scoot and Tigerair a wider portfolio, reducing their reliance (and the SIA Group’s reliance) in the Singapore market. The new airlines are among eight new LCCs slated to be launched in 2014, accelerating growth and further shaking up a sector of the industry which has already seen rapid fire change in recent years. NokScoot, a joint venture between SIA long-haul LCC subsidiary Scoot and Thai Airways short-haul LCC affiliate Nok Air, will operate widebody flights from Bangkok Don Mueang in competition with start-up Thai AirAsia X. Tigerair Taiwan, a joint venture between the Tigerair Group and Taiwan’s China Airlines (CAL), will operate narrowbody flights from Taipei in competition with TransAsia’s planned LCC subsidiary. Tigerair and Scoot have also announced an increased partnership in Singapore with the filing of an application for anti-trust immunity. In addition Tigerair has forged its first interline partnership outside the SIA Group, with Indian LCC SpiceJet. NokScoot and Tigerair Taiwan are poised to be two of several new LCCs that launch in Asia-Pacific in 2014. The Asia-Pacific region currently has 46 LCCs, with Thai Lion the latest to launch on 4-Dec-2013. The number of LCCs in the region will swell to well above 50 in 2014 as about eight LCCs are added. These include three more LCCs in Thailand – Thai VietJet, Thai AirAsia X and now NokScoot – along with the first two for Taiwan – Tigerair Taiwan and TransAsia’s not yet named subsidiary. AirAsia India and Jetstar Hong Kong also aim to launch in 2014 pending regulatory approvals while China’s Spring Airlines is seeking to launch its planned affiliate in Japan. All eight of these carriers may not end up launching by the end of 2014. But it is likely other new LCCs will be established and launched by the end of 2014, including Indonesia AirAsia X and a potential second LCC in Myanmar. Southeast Asian and South Asian LCCs are on average much bigger than their counterparts in North Asia. As a result the LCC penetration rate within Southeast Asia and South Asia is now above 50% compared to only approximately 10% within North Asia. The overall LCC penetration rate within Asia-Pacific is about 24%. While there is more room for market share increases in North Asia, there are still opportunities for rapid LCC expansion in Southeast Asia as the overall size of the market is expanding more rapidly. Southeast Asia’s LCC sector has seen growth of about 20% this year and a similar clip is likely for at least the short to medium term, driven by expansion of Asia’s four major LCC groups – AirAsia, Jetstar, Lion and Tigerair. These groups now account for a majority of capacity in Asia and about 70% within Southeast Asia. Jetstar and Tigerair are both affiliated with full-service airline groups; Qantas owns 100% of Jetstar and minority stakes in Jetstar’s Asian affiliates while SIA which owns a 33% stake in the Tigerair Group. In Southeast Asia, there are currently six AirAsia-branded carriers (in four countries), three Tigerair-branded carriers (in three countries), three Jetstar-branded carriers (in two countries) and four Lion LCC affiliates (in three countries). Taiwan will expand Tigerair’s portfolio for the first time to North Asia, where Jetstar already has one carrier (Jetstar Japan) and has another in the works (Jetstar Hong Kong). AirAsia currently does not have a North Asian affiliate, after selling its stake in AirAsia Japan (now known as Vanilla Air), but is working on launching its first affiliate in South Asia. Tigerair and Jetstar both have affiliates in Australia. All the major Southeast Asian countries now have LCCs while two of the main North Asian markets are seeing home-grown LCC activity for the first time – Taiwan and Hong Kong. Hong Kong Express became Hong Kong’s first LCC after adopting the LCC model in Oct-2013 while Jetstar Hong Kong’s application is still pending. CAL first announced plans to establish an LCC in Nov-2013. The Taiwanese airline group was widely expected to forge a partnership with a foreign LCC group by the end of Dec-2013 while TransAsia has decided to pursue an independent path. CAL completed an agreement with Tigerair on 15-Dec-2013 which sees the Singapore-listed Tiger Airways Holdings acquiring a 10% stake in the new carrier. Tigerair Group CEO Koay Peng-Yen said during a 16-Dec-2013 media conference call that the CAL Group will initially own the remaining 90% stake but Tigerair could later discuss increasing its commitment. Although Tigerair will have significantly smaller stakes in Tigerair Taiwan than its other affiliates –Tigerair Mandala (Indonesia), Tigerair Philippines and Tigerair Australia – the new carrier will use the Tigerair brand and website and have the same type of operation as its sisters. Mr Koay calls it a “win-win proposition” as it allows Tigerair to expand its “paw print” into the North Asian market, which remains relatively under-penetrated by LCCs, but is “asset light”. Tigerair Taiwan is expected to launch by the end of 2014 with initial capital of TWD2 billion (USD68 million). Mr Koay says Tigerair Taiwan’s network will include mainland China, South Korea, Japan and Southeast Asia. Pursuing opportunities in the fast-growing cross-Strait market will particularly be a focus area. Mr Koay expects Tigerair Taiwan will be able to leverage Tigerair Singapore’s increased presence in mainland China, where in late Dec-2013 it will add Ningbo as its fifth destination. Tigerair Singapore also already serves Taipei with 11 weekly flights from Taiwan, opening up the possibility of connections for Tigerair passengers throughout North Asia. Tigerair currently does not serve any destinations in South Korea or Japan (although Tigerair Philippines is planning to launch services to Japan). Mr Koay says the two shareholders expect Tigerair Taiwan to operate 12 aircraft within two to three years. But he adds this is not a formal commitment and Tigerair “will continue to assess and review [the fleet plan] with our partner China Air Lines”. He adds that in the “near-term” Tigerair Taiwan will operate A320s, giving it fleet commonality with its sister carriers. Mr Koay says some of Tigerair Group’s 10 A320s slated for delivery during the fiscal year beginning 1-Apr-2014 will be allocated to the new Taiwanese carrier. The group has been spreading its aircraft between its affiliates – with Tigerair Singapore again taking most of the deliveries in 2013, leading to a rapid increase in capacity which has negatively impacted load factors, yields and profitability. Having the option of placing some aircraft with a new affiliate will alleviate the pressure in Singapore and should improve the overall outlook for the group. It will also make it easier for some of the group’s affiliates to focus on growing its fleet by leasing second-hand aircraft – this is particularly the preferred path for Tigerair Mandala, which has started leasing second-hand A320s to supplement its fleet. 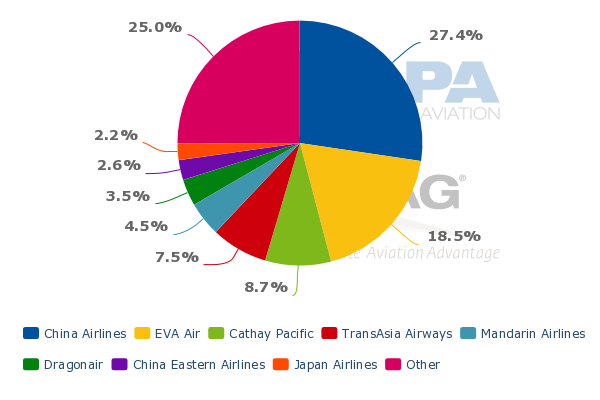 LCCs currently only account for a 6% share of seat capacity in Taiwan, according to CAPA and OAG data. CAL is Taiwan’s largest carrier, accounting for about 27% of total capacity. Tigerair also announced on 16-Dec-2013 a partnership with SpiceJet which will significantly boost its presence in another key market, India. The partnership does not include an equity stake – at least not for now – but will result in Tigerair and SpiceJet interlining from 1-Jan-2014. The interline will give Tigerair Singapore offline access to 14 destinations that are served by SpiceJet beyond Hyderabad, growing Tigerair’s Indian network to 20 destinations. Tigerair Singapore currently serves six destinations in India. Tigerair currently serves Hyderabad with five weekly flights, according to OAG data. With the new partnership, additional capacity to Hyderabad is likely. Tigerair says the Hyderabad airport will be facilitating Tigerair-SpiceJet connections by providing a free service to collect and transfer checked-in baggage for passengers travelling on connecting flights between the two airlines. There is huge potential upside as the partnership could later be extended to Tigerair’s five other existing India routes and support the launch of new routes to India from Singapore or Indonesia, where Tigerair Mandala is based. Of more strategic importance, Tigerair could later cement the partnership with an equity stake. SpiceJet has been looking at selling a minority stake to a foreign carrier since India adjusted regulations in 2012 to allow foreign direct investment. The partnership also gives SpiceJet access to Singapore, which is currently served by rival LCC IndiGo. Partnering an Asian LCC group should boost SpiceJet’s outlook as competition in India’s LCC sector intensifies with the upcoming launch of AirAsia India. SpiceJet is India’s second largest LCC and currently accounts for a 21% share of domestic capacity. In Hyderabad SpiceJet is also the second largest domestic carrier after IndiGo with a 30% share of domestic capacity. 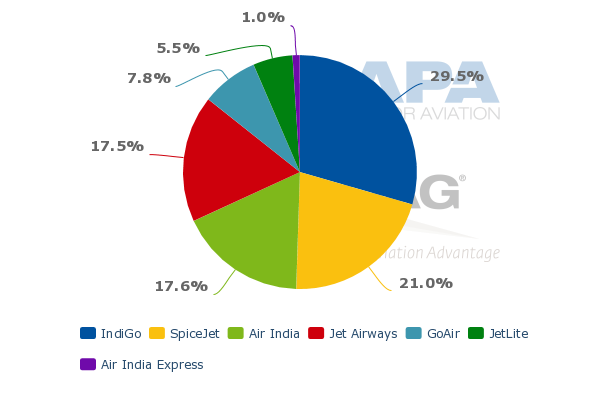 SpiceJet also has a much smaller 3% share of capacity in India’s international market. Partnerships with Tigerair and potentially other carriers could enable SpiceJet to significantly grow its presence in the international market. Mr Koay says Tigerair will look to add other interline partners in line with the group’s strategy to pursue growth “without stretching our internal resources”. Tigerair currently interlines only with one carrier, Scoot. Partnerships have emerged as an important component of Tigerair’s new business model. The group previously followed a pure LCC model, focusing only on point-to-point traffic. The group has hybridised and is now pursuing transit passengers and interlines. The partnership with Scoot was first forged in late 2012 and now includes the sale of joint itineraries promoting connections in Singapore between the two carriers. Tigerair and Scoot announced on 16-Dec-2013 the signing of a new alliance agreement which, pending regulatory approval, will result in aligning commercial activities in the Singapore market. The two carriers have submitted an application to the Competition Commission of Singapore (CCS) for anti-trust immunity. If approved, Tigerair and Scoot will start coordinating schedules and pursuing joint sales and marketing of services (including pricing) on overlapping routes. The new partnership could also potentially support the launch of new joint routes. Tigerair and Scoot currently overlap on four routes – Singapore to Bangkok, Hong Kong, Perth and Taipei. The new partnership could see the carriers adjusting their schedules on these routes to provide better options for their passengers. Mr Koay said during the 16-Dec-2013 media briefing that following CCS approval, which could take several months, the objective will be to "spread out" the two carrier’s schedules. He added the arrangement will apply to both existing and potential new destinations. The decision to lodge an application with the CCS is not surprising as SIA indicated during its 1HFY2014 results briefing in Nov-2013 that Scoot was discussing expanding its partnership with Tigerair and looking at whether the two carriers may need to seek approval from anti-trust authorities. While Scoot and Tigerair have benefitted from their current partnership, the upside without full commercial cooperation and joint sales in their home market is limited. In the quarter ending 30-Sep-2013, the SIA Group disclosed that there were only SGD740,000 (USD590,000) in tickets sold as part of the Scoot-Tigerair interline agreement (includes tickets sold by Scoot on Tigerair-operated flights and sold by Tigerair on Scoot-operated flights). Scoot also has been looking at adding interlining partners outside the SIA Group and – more quietly – been exploring potential joint ventures in other Asian countries. Scoot announced on 16-Dec-2013 the signing of a memorandum of understanding with Nok Air to establish a new carrier in Bangkok. NokScoot will be based at Bangkok Don Mueang and operate medium and long-haul routes with widebody aircraft. Nok, which operates a fleet of 737-800s and ATR 72s based at Don Mueang, is now a short-haul carrier serving predominately the domestic market. The announcement stated that Scoot will have a 49% stake in NokScoot while Nok will have up to 51%, which seems to open up the possibilities of a third investor. NokScoot is being established with an initial investment of THB2 billion (USD62 million). Thai Airways owns a 39% stake in Nok, which earlier this year completed an initial public offering on The Stock Exchange of Thailand. Establishing an overseas affiliate is an impressive achievement for Scoot as the carrier only launched operations in Singapore 18 months ago. Scoot currently operates five 777-200s and has 20 787s on order for delivery between late 2014 and 2016. NokScoot will likely be allocated some of these aircraft. NokScoot opens up a second home market for Scoot and allows Nok and Thai Airways to enter the emerging medium/long-haul low-cost segment. Nok and Thai Airways have looked multiple times in recent years at establishing a long-haul LCC, with independent and Nok-branded options considered. The establishment of Thai AirAsia X prompted Nok to re-look at long-haul LCC options earlier this year, leading to talks with Scoot. Thai AirAsia X is now in the latter stages of securing an air operators’ certificate. The new carrier aims to launch in early 2014 and focus on linking Bangkok with markets in North Asia and Australia which are already served from Kuala Lumpur by Malaysia-based AirAsia X. AirAsia already has a short-haul affiliate in Thailand, Thai AirAsia, which is the main competitor to Nok and is backing the establishment of Thai AirAsia X.
NokScoot will likely compete on similar routes, leveraging Scoot’s presence in Australia and North Asia. The new carrier will also be able to leverage Nok’s strong brand and expertise in the local Thailand market. Nok’s brand is not well known outside Thailand, making a partnership with a foreign airline such as Scoot/SIA critical given Thailand is primarily an inbound market. Scoot already serves Bangkok Suvarnabhumi with one daily flight from Singapore with connecting services to Australia, giving it some familiarity with the Bangkok market. The establishment of NokScoot and Tigerair Taiwan will give the SIA Group stakes in seven LCCs, roughly matching the number of LCC investments at Malaysia-listed AirAsia Berhad and Qantas. While SIA’s stakes in four of the carriers are very small, particularly Tigerair Taiwan (3.3%), the overall strategic significance of SIA having quickly expanded its portfolio to covering such a large portion of the Asia-Pacific LCC market is significant. SIA, with its fully owned Scoot and its affiliate Tigerair, has now emerged as a major player in Asia’s dynamic LCC sector. Other Asian full-service airline groups will undoubtedly look to follow the innovative models pursued by Qantas and now SIA, building on what until now have been investments in individual carriers limited to their home markets (such as Garuda in Citilink, Thai Airways in Nok, KAL in Jin and ANA in Peach/Vanilla). Even Cathay, which has been strongly opposed to the idea of establishing an LCC subsidiary, may need to re-consider its position. The leading independent LCC groups – AirAsia, Lion and a much smaller but extremely ambitious VietJet – will also need to respond. Asia’s LCC sector has seen incredible traffic growth in recent years, driven in part by the launch of several new carriers and rapid organic growth at some of the region’s older LCCs, which are keen to leverage their first mover advantage. With several mammoth aircraft orders placed by Asian LCC groups over the past two years (with more orders to come) and another eight Asian LCC launches now slated for 2014 (with more new LCCs yet to be announced), the momentum will continue to build. This is only a start. Asia’s budget airline market has clearly emerged as one of the fastest growing sectors in the global aviation industry. Market conditions remain favourable to support further growth and more rapid fire changes, along the lines of the major developments from 16-Dec-2013. But consolidation is also likely. There will inevitably be some casualties as battle lines are drawn and competition between the fast-expanding groups – independent LCC groups and the still emerging FSC/LCC combos – continues to intensify. Each type is powerful in its own way, with a common theme of multiple cross-border bases.